Cozy and warm, this one-piece, top-down jacket knits up in no time at all. It has a loose fit, tapered armholes (see photos below) and a long rib collar with matching turned back cuffs on three-quarter length sleeves. 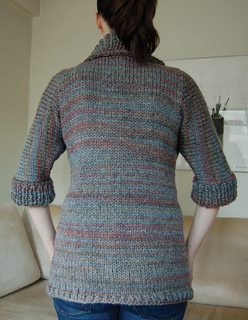 Sleeve cap shaping is worked with vertical decreases below shoulder. There is a 3-stitch rolled edge from base of collar to hem. Jacket may be closed with a pin or, if you prefer, a frog closure may be added just below the collar. Perfect for indoor and outdoor wear, especially in Spring and Fall.